The ubiquitous Poha, a favourite of the Gods? Perhaps! One of the stories in the mythology of Lord Krishna, says that when his friend Sudhama was looking desperately for relief from the penury he was in, Sudhama’s wife Kalyani asked him to take help from Lord Krishna. When Sudhama went to visit Lord Krishna at Dwaraka, he carries with him as a gift to the Lord, some poha (Wikipedia says some versions claim that he carried poha fried in sattu powder, called sattu-peeth pohe). Sudhama did not have anything else to gift his friend but he remembered that Lord Krishna liked Poha, and hence took it as his gift. Well prepared poha can indeed be tasty enough to be anyones favourite, even the Gods! Nutrition wise, Poha is chockfull of iron (20mg of iron in every 100 raw flakes). It is rich in carbohydrates and in fibre, low in gluten and is easy to digest. And its low on fat (except for the oil we use in making the poha dish). As it is not high on protein content, adding vegetables to the poha can improve on this aspect. 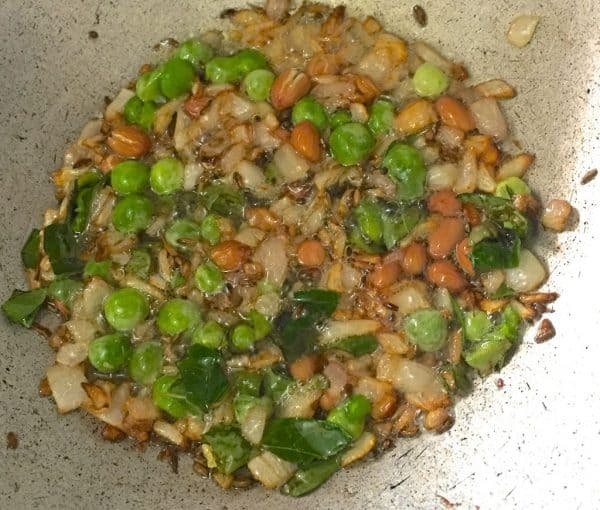 I add peanuts and fresh green peas to the poha to make up for the low protein quotient. Being an Indian dish, there are many different varieties and versions of poha made across the country. 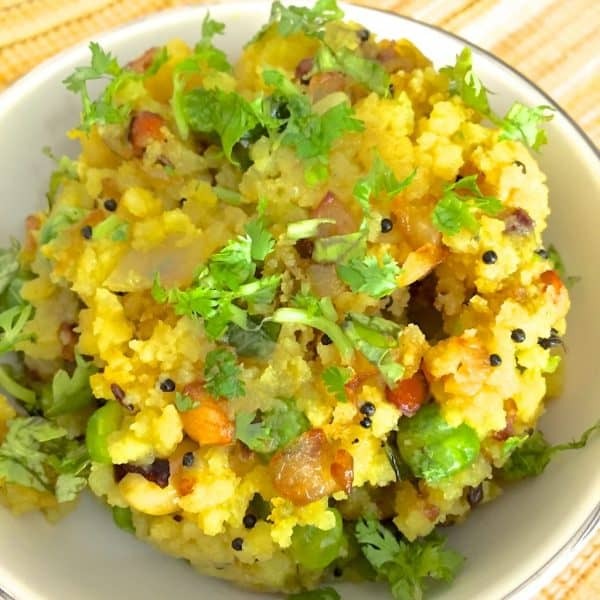 Most of them are savoury, from Poha in the Northern parts of India to Aval Upumma in the Southern regions. In Maharashtra, Poha is a popular dish, more spicy than in most other parts of India, and is served usually along with a spicy local curry called ‘tarri’ comprising chilli powder and masalas fried and then cooked with tamarind water. I was first introduced to this dish during frequent visits to Rajasthan. The company canteen would serve Poha for breakfast at least 3 days in a week. I would turn up my nose, ask for toast and omelette instead, and then silently dream of hot dosa with sambar and mulagaipudi (gun powder/ idli chilli powder). I finally did taste it one morning, and found, surprise, surprise, that it was very tasty and a satisfying breakfast, which I soon introduced into my kitchen too. It is now a favourite breakfast item at home. I have given here my version of Poha, For a variation, you could add small cubes of potato, and either boil them before hand and add to the poha after you have added the peas, or else, fry them along with the peas, though it would take a few minutes more for the raw potatoes to cook. Select the thicker variety of Poha (Aval, Beaten or Pressed rice) so they do not get easily mashed as you want them whole and separate when you finish making the Poha. Wash the poha flakes gently in a colander, drain, sprinkle salt and soak for 2-3 minutes in water. Drain and set aside. Chop the onions, green chilli and tomatoes and mince ginger and curry leaves. Set aside. Soak the peas in a bowl of water and set aside. Heat oil in a heated pan. Fry the peanuts for 2 minutes or till they begin to split. Using a slotted ladle, remove the peanuts draining the oil at the side of the pan. Transfer the peanuts to a dry bowl and keep aside. 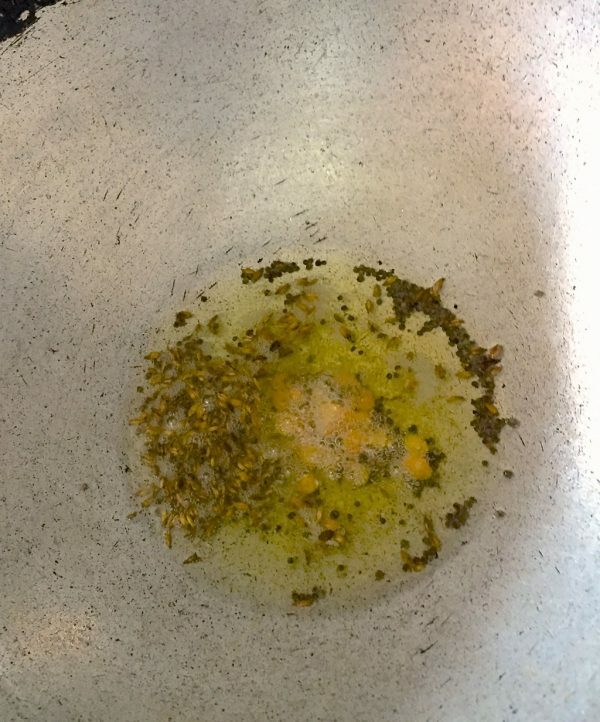 In the remaining oil, burst the mustard seeds and then fenugreek (methi), add cumin (jeera) and sauté for 10 seconds. Add the hing (asafoetida) and the split gram dhal ( split chickpea lentils/ split Bengal gram dhal), sauté for 10 seconds. Add the green chilli, turning it over so that it scalds on all sides. Add curry leaves and let them sputter. Sauté onions till they are translucent (about 2-3 minutes). Add ginger, sauté for 10 seconds. Strain the green peas, add to the pan and sauté for 2 -3 minutes on high flame, stirring till the peas are cooked. Add 3/4 of the fried peanuts and keep the rest aside for the garnish. Add tomatoes and turmeric, sauté for 20 seconds. Squeeze out any left over water from the poha flakes, add them to the pan and stir briskly so all the ingredients mix well. Taste for salt and add more salt if required. Cook the poha for about 3 minutes, stirring frequently so that the rice flakes do not stick to the pan. Turn off the stove and transfer the poha to a serving dish. 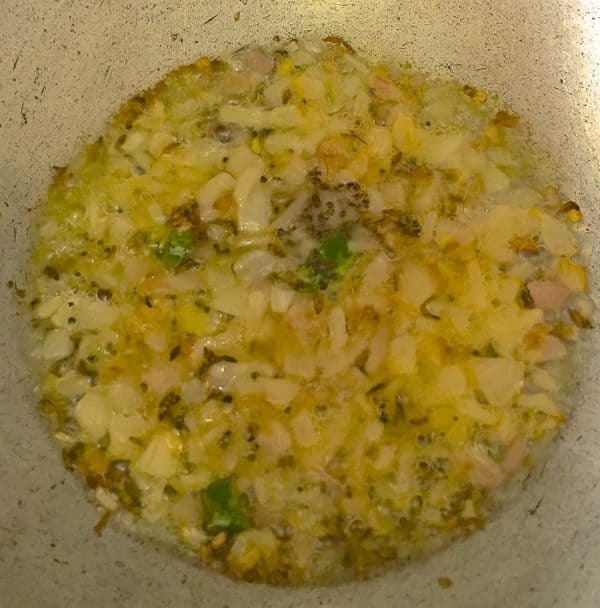 Sqeeze the juice of one lemon and add the lemon juice and reserved fried peanuts to the poha, and mix gently. Adding lemon juice is good, as it helps the body to absorb the iron from the poha flakes.